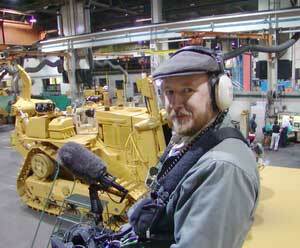 Field Mixer / Location Audio Recordist. HDVideo Camera Crew ⋅ DSLR Video Production ⋅ Film. field-audio mixing / recording for network broadcast television, film, and video productions. National Geographic; ABC; BBC; CBS; ESPN; NBC 'Dateline'; The Discovery Channel; The Learning Channel; Animal Planet; The Travel Channel; HGTV; The Food Network - among many others. Lectrosonics 411a ⋅ 210d ⋅ 195 ⋅ SRa - 8 units. Sennheiser MKH50 ⋅ MKH 60 - on 8' to 16' poles. Lectrosonics audio 'hops' to multi camera - w/ various mounts. Sennheiser G3 audio 'hops' to multi DSLR - w/ acc. shoe mounts. Zaxcom IFB200 / ERX2-TCD timecode 'hops' to multi camera - w/ various mounts. Denecke TS-C ⋅ TS-3 timecode slates. Lectrosonics wireless headsets / IFB. MP3 audio timecode transcripts - w/ FTP upload. Peter Engh Quick Release cable systems / interface products. I am familiar with the scientific, military, cultural, and natural wonders of New Mexico and the greater Southwest region. A Respected Member of the New Mexico Film Community for over 15 years. Working on Discovery Channel's "Inside Death Row." I'm at the New Mexico State Penitentiary with cameraman Craig Hastings. Photo courtesy of Artu Arin. NOT interested in LO / NO / Deferred rates. 26+ years of on-location documentary sound-for-picture experience. NOT interested in mixing for feature films, indies, or long-form narratives for episodic television.